Canyon Ranch Miami Beach residents should sleep a little bit better at night. The uncertainty of having their beloved building stuck in a whirlwind of negativity has now subsided to a degree with some new news. It’s been a tense few months as the amazing destination resort, based on positive energy, health and well-being, was paralyzed by the gloom and doom of a bankruptcy auction that could easily place the development into the wrong hands. I was personally involved with a couple of different groups that had interest in the auction process, so I was able to hear a wide range of opinions on the state of affairs and potential future of the hotel and amenities. Some of the potential resolutions to the auction were good and some were quite bad. I’m happy to report that I am quite optimistic about the outcome to-date. The good news is that a winner bidder has now surfaced from the auction of Canyon Ranch Miami Beach. I was delighted to hear that Z Capital Partners won with a bid of $21.6 million, which was above the stalking horse bid of $12 Million by 360 Vox, LLC out of Canada. The winning bid was easily enough to pay off the estimated $17.3 million in liabilities that is owed. There is a word of caution though, the results of auction still need to be approved by a bankruptcy judge on September 12th. So, what is it about Z Capital Partners, based out of Chicago, that has me excited? What is the grounds for optimism? Canyon Ranch Miami Beach has some bad news circulating that may be quite harmful to the amazing brand. Some big news has hit the press this week regarding the filing of Chapter 11 bankruptcy protection by a Lehman Brothers Holdings Inc. subsidiary that owns the Canyon Ranch Hotel and Spa. Apparently, the filing of the status is meant to be a positive mechanism to help complete a sale of the amazing property with the best condo amenities in Miami. A new potential buyer appears to be a conglomerate with a portfolio of hospitality properties that include the Enchantment Resort in Sedona. So, what do we make of this negative news about the amazing Canyon Ranch Miami Beach? How should it be interpreted? Lets first look at the conditions leading to problems. Back during the Great Recession, a Lehman Brothers implosion was the talk of the financial community. It secured ownership of Canyon Ranch Miami Beach through a deed in lieu of foreclosure. The development group, WSG, experienced some significant difficulties in bringing the half a billion dollar+ development to the market unscathed during teeth of the Great Recession. So consequently, the project fell into the wrong hands at the wrong time. Lehman Brothers had massive problems of its own and was ill-equipped to properly manage the new five star trophy property. Does Canyon Ranch Have the Best Condo Amenities in Miami? Out of all of the oceanfront condos for sale in Miami, Canyon Ranch definitely stands out from the crowd. The amenity package that the building offers is world-class. Well, perhaps even the descriptive term world-class doesn’t do the amenities justice. Better stated, the condo amenities at Canyon Ranch Miami Beach are simply out of this world. I can personally attest to the fact that living in the building for an extended period of time will definitely have a positive effect on your overall quality of life. 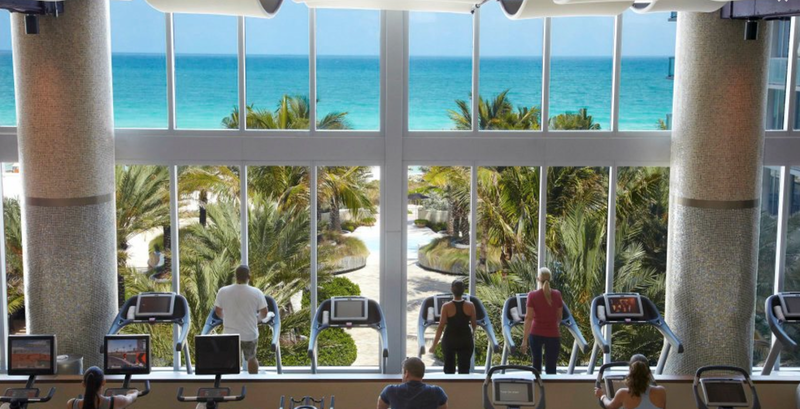 Canyon Ranch Miami Beach features the only complete holistic wellness living environment in all of South Florida. It has been designed to be the ultimate home where the residents do not have to venture out of the premises to enjoy an invigorating workout, pamper their senses, or soothe their minds.